From mid-1965, after its strategy of “special warfare” was basically defeated, the U.S. leadership had to shift its policy to “local warfare” with the deployment of massive U.S. expeditionary forces into South Vietnam. In this new phase of the war, U.S Command combined “search and destroy” actions with “rural pacification” activities and declared that the People’s Liberation Armed Forces of South Vietnam would be completely annihilated in just 18 months. U.S. forces conducted extensive “search and destroy” operations across South Vietnam to hunt for “Viet Cong”; among them, the two major counteroffensives in dry seasons of 1965-1966 and 1966-1967 were the most notable campaigns. Despite this aggressive escalation, the U.S. Imperialism was unable to destroy our military and people’s fighting spirit. On the contrary, they were bogged down in the quagmire of Vietnam and had to send more troops and increase funding for its war efforts. However, with these activities, the enemy had managed to cause a lot of casualties for our people and military units in the South. After carefully assessing the situation, the Politburo, the Central Military Commission, and the General Command determined that: conventional tactics were not suitable to defeat “local warfare”, so that we must find an alternative to deal with this strategy and force the U.S. Imperialism to recognize that it can not just conquer the nation of Vietnam with steel and blood. To that end, the Central Office for South Vietnam and its subordinate military units conducted situation assessments to grasp the balance of power between our forces and the enemy, and forecast the enemy’s activities in dry season of 1968-1969. In January, 1968, 14th Plenum of 3rd Central Party Committee expressed that: to bring the revolution and the revolutionary war to a new era and achieve a decisive victory, we must reach a major turning point in the conflict. To do this, we must choose critical areas of operation to apply new tactics, dealing a heavy blow to the enemy force. The plenum’s resolution made clear that the major objective of upcoming actions was cities, towns, enemy command centers, and military logistical infrastructures in the South; the 3 major cities: Saigon, Hue, and Danang would be our primary targets; and military actions would be coordinated with popular uprisings across three strategic regions in the South. The ultimate goal of this plan was by initiating surprising offensives, we would undermine the morale of U.S. invaders and change the balance of power in our favor. To strengthen the fighting spirit of our forces, party committees and political departments at all levels, both in the military and civil branches had constantly conducted political work since U.S. began to deploy combat units in the South, especially during its first strategic counteroffensive. Ideological and political education activities focused on exposing the U.S and Saigon puppet government’s war crimes and their evil nature; these activities also expressed that our cause was just and a final victory for the nation of Vietnam was inevitable. At the same time, political work upheld our patriotic tradition and determination to fight and to win; and promoted the wise words of President Ho Chi Minh, such as: “Nothing is more precious than freedom and independence”, or “We will continue our fight to wipe out every single invader dares to set foot on our soil.” During the Tet Offensive and Uprising, we further conducted political work for all units across all battlefields to promote the spirit of “the whole country goes to war”, “all people occupy the street”, or “everything for victory”. With these slogans, a movement of emulation to achieve the title “American troop slayer” quickly spread across all southern regions. In this movement, there were many distinguish examples of combat merit; for instance, Hero of the People’s Armed Forces Pham Van Coi, commander of Duc Lap Commune guerilla contingent, Cu Chi District and his comrades, adeptly employing the tactic of “catch the enemy’s waist belt to deal the blow”, were able to cause heavy casualty to local U.S. troops on a daily basis. 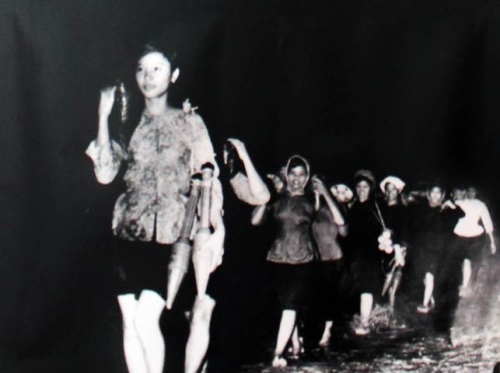 On the night of January 30, early morning January 31, 1968 (Lunar New Year Eve), our people and military units, with an overwhelming determination and fighting spirit, simultaneously initiated attacks and uprisings across southern region. The primary targets were urban areas, especially Saigon, Danang, and Hue, as well as enemy airbases, logistical depots, and military bases. The enemy was confused and caught by surprise and had to respond from a very passive stance. In Hue, we held total control of the city in 25 days, established a revolutionary governing body and managed to repel hundreds of enemy counterattacks. In Saigon – Gia Dinh, our forces assaulted many critical targets such as: the U.S. Embassy, Gia Long Palace, RVN General Staff Headquarters, RVN Radio Station, etc., which were the command centers of the enemy forces; at the same time, the enemy communication and transportation systems were disabled in many days. Besides military activities, our civilian political forces in cities and rural areas initiated popular uprisings, removing “strategic hamlets”, taking control in many districts and expanding liberated areas. Needless to say, the Tet General Offensive and Uprising was a surprising strike against the U.S Aggression Force; shook the U.S society to its core and echoed across the globe, completely defeating the strategy of “local war”. However, this was not a complete victory, after initial successes, our forces had to suffer certain casualties from enemy counterattacks. Nevertheless, this was a historical victory and an inevitable progress of the revolutionary movement in the South. This victory was a solid proof of our determination in fighting against the U.S Imperialism and our desire for national reunification. At the same time, it showed the combined power of the will of the people and the commitment of the Party. This interrelationship had became stronger than ever in the hardest times of our struggle; and provided us with an invaluable lesson not only in wartime, but also in the current era of building and safeguarding the country. Nowadays, the political climate remains unstable globally and regionally, creating mixed impacts on our country’s stability and bringing us both opportunities and challenges. Notably, our adversary continues to push ahead its strategy of “peaceful evolution” to sabotage our revolutionary cause. Additionally, many cadres and officials have shown signs of political and moral corruption, which undermines our regime and our Party’s reputation. More than ever, now we must uphold the unity of the people’s will and the Party’s commitment in the current era of building and safeguarding the country, like we did in the 1968 Spring General Offensive and Uprising. To do so, there are several fundamental objectives we need to focus on. First, strengthen our Party in political, ideological, structural and moral aspects, and enhance the trust of the people in the Party. Vietnam’s revolutionary history in general and the Tet General Offensive and Uprising in particular, have shown that “people’s will” and “Party’s commitment” are always united, and this combination has the potential of generating overwhelming power of revolutionary revolution, capable of defeating any enemy. The direr the situation was, the more united “people’s will” and “Party’s commitment” became. “Party’s commitment” has been mainly demonstrated by political principles, and those principles must always be appropriate to the people’s will and desire. “People’s will” is presented by their trust in the leadership of the Party and their willingness in compliance with the Party’s principles and the state’s rules and laws. Needless to say, a revolution is the people’s work led by a representative political party; so that our Party’s ultimate duty is serving the interests of the masses. To do so, our Party has constantly reformed itself to improve its political, ideological and moral strengths. Taking Marxism-Leninism and Ho Chi Minh ideology as fundamentals, firmly grasping the actual condition of the country and rightful desires of the people, our Party has always sought to develop effective and practical policies and strategies to push ahead our Renovation and international integration processes. That said, our Party has placed emphasis on economic development; maintaining socio-political stability; enhancing national defense and security; improving the people’s living standards; and seeking to fulfill the goal of “prosperous people, powerful country, democratic, just and civilized society”. Besides, the work of Party building has always been carried out in compliance with the 4th Central Resolution (tenure XII) and Politburo Guideline 05-CT/TW on studying and following the ideology, moral examples and the way of life of President Ho Chi Minh. In addition, Party members and officials must be educated to really become “public servants”, and have strong bonds with the people. Furthermore, they must always uphold constructive criticisms and self-criticizing spirit to fight political and moral corruption; “self-evolution” and “self-transformation”; and many other frauds such as wastefulness, negligence and keeping distance from the masses. Also, via activities of Vietnam Fatherland Fronts and other socio-political bodies at all levels, the Party has constantly created favorable conditions for the people to take part in the development of Party’s strategies and policies, and contribute to the processes of Renovating, industrializing and modernizing our country. Second, build a strong and transparent law-ruled socialist state of the people, by the people and for the people. The Constitution of Vietnam Socialist Republic asserts that: Vietnam Communist Party governs the state and the society. Therefore, the unity of “Party’s commitment” and “people’s will is also demonstrated by the governing ability of the state. That said, the work of complementing legal system and supervising mechanisms over government institutions must be focused in order to improve their service performance for the people. Especially, the role of the Congress – the supreme ruling institution of the state - must be upheld in institutionalizing the Party’s principles and policies, in making decisions on critical state issues and in resolving social problems such as poverty, income gap, unemployment or insufficient social welfare, to strengthen the consensus and confidence of the people in the Party. At the same time, the rule of law must be strictly exercised, and law enforcement must be improved; also, the people’s rightful interests must be respected, and all the acts that exploit democratic loopholes to violate the law, sabotage the integrity of the Party, the State and the regime, undermine civil rights and national interests must be strictly punished. In addition, public servants’ work ethics must be improved and all the frauds in governing bodies such as corruption, bribery and red tape, etc., must be completely eliminated. Third, emphasize the role of Vietnamese Fatherland Front and other political – social organization in canvassing and attracting people. As an important part of the general political system, the Vietnamese Fatherland Front plays a critical role in gathering people for a general all-people united block, canvassing, educating and attracting those from different social groups for conducting the revolutionary action movement started by our Party. In some way, the Front serves as the bridge between “Party’s commitment” and “people’s will”. Therefore, the Vietnamese Fatherland Front should improve its propagation and the awareness of people of all social classes of our Party’s guidelines and the Government’s policies and laws as well as provinces’ regulations. Moreover, the Front needs to well organize the movement of patriotic emulation, canvasses, among which, the key ones include: “All people get united for new rural area model” and “Vietnamese people give priority to Vietnamese products”, etc. Moreover, the Vietnamese Fatherland Front need to forge social consensus, contributing to achieving economic–social and defense-security objectives and missions as well as those related to Party and whole-nation unity block building. In current situation, the Fatherland Front and other political–social organization at all levels should pay attention to improving their structures, proactively seeking for innovation and enhancing their effectiveness, following the motto: “To be oriented and adhered to grassroots level”. They should also regularly meet people and listen to their wonders, desires and proposals, and give good consultancy to Party’s committees and authorities about proper solutions for people’s problems when they start from local level. At the same time, the Fatherland Front should try to improve social critics and observation, especially over the matters related to people’s legal rights and interests. They should also encourage people to hand in hand build their new rural areas, repair disaster damages, eradicate hunger and reduce poverty, etc. Fourth, utilize our Military in propagation, contributing to consolidating “the posture of people’s hearts and minds”. Founded by the people and fight for the people, the VPA is a revolutionary army which has blood bond with the people. In new situations, the VPA should promote its role as a “working army”, which means to proactively improve its public relations, making important contributions to strengthening military – people relations and “the posture of people’s hearts and minds”, thereby uniting “Party’s commitment” and “people’s will”. The VPA’s public relations should focus on taking part in building, consolidating and improving grassroots political system; helping people develop their economic, cultural, social life and eradicate hunger, reduce poverty, prepare for and respond to natural disasters, repair their damages; implementing ethnic, religion and social policies. Moreover, the VPA needs to propagate and persuade people to fight against “peaceful evolution” and avoid being tempted by distorted and provoking information, which is provided by our adversaries to separate our Party, Government and Army from people; to raise their awareness of as well as proactively participate in building people’s defense and security postures; and to join movements and canvasses launched by our Party, Government and Vietnamese Fatherland Front. Regular troops, Border guard, and defense–economic units stationed at strategic, remote, border areas or islands should foster their public relations and propagation to persuade local people to follow Party’s guidelines, Government’s policies and laws, making use of people’s strength in combating crimes, eliminating unsound customs and creating favorable environment for economic – social development, defense – security strengthening and political – social stability upholding. To learn from and apply the lessons about uniting “Party’s commitment” and “people’s will” from the 1968 Tet General Offensive and Uprising to today’s practice is an important and urgent need. Doing it well will serve the blood relations between Party and people, helping our Party to understand people, and people to trust our Party, thereby creating the general power for the success of our course of innovating, building and defending the socialist Vietnam.